The cognitive benefits of learning a second language in early childhood are well researched. Studies show that it increases executive functioning, problem solving, and mental flexibility. Bilingual students outscore their monolingual peers in standardized testing, and they maintain focused attention better than other students. A second language also gives students broader career and life opportunities as adults and the skills to travel and connect with the world as global citizens. Presidio Knolls offers a “full immersion” program that encourages students to authentically use a second language for real and immediate purposes every day. Starting in preschool, our students spend 80% of learning time immersed in Mandarin. 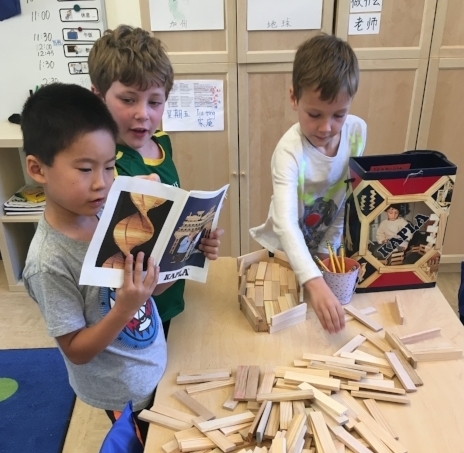 Through projects, song, dance, play, field trips, and inquiry-based learning, our preschoolers develop strong foundational Mandarin skills that carry them through elementary and middle school. Children do not need Mandarin support at home to succeed in this environment - they develop into proficient Mandarin speakers and listeners just through interactions in the classroom. Mandarin immersion also comprises 80% of academic time during elementary school and 50% of academic time in middle school. Students learn to use Mandarin to communicate about a wide range of subjects through our integrated Units of Exploration (UoEs), which include the knowledge, concepts, skills, and habits of heart and mind that prepare students to explore, understand, and engage with the world. There is also a full class period each day devoted to Mandarin studies so that students can understand Chinese culture and history - not just read and write the language. Attending to the whole child, not just to the academics. We want to prepare our students to live healthy, connected, just, and successful lives by ensuring they have the social-emotional skills, as well as the knowledge, to pursue their passions. Building a sense of community and collaboration amongst our students so they feel safe sharing and learning from each other. Our integrated curriculum also encourages collaborative problem solving and team work. Social justice and taking our classroom learnings into the wider world to improve our community, both locally and internationally. Developing our students’ intrinsic motivation so they can become lifelong learners. Within each Unit of Exploration (UoE), students are encouraged to pursue their personal interests and share their findings with their classmates. Delving into a topic and developing a deep understanding of the subject matter. We believe that information learned should be understood in context and for a purpose. Our integrated Units of Exploration (UoE) incorporate work in two languages, with a focus on inquiry, literacy, science, and social studies. Math, art, and music are also integrated when possible. Active learning, with students directing the course of inquiry within each unit. Students work together to formulate questions, find the answers, and think through possibilities. All students are encouraged to be self-reflective, with our older students leading their parent-teacher conferences. Education is not just academics - it’s about helping our students develop a strong sense of self and learn how to interact with others. In preschool we help our students develop a positive sense of self-identity, belonging, and self-value that we hope carries through their entire lives. In elementary school we layer on meditation classes and lessons that focus on specific topics like self-control, emotional understanding, setting and respecting boundaries, standing up for yourself and others, and dealing with frustration and distraction. This focus on social emotional learning and development of the self extends through middle school as students go through the most intensive period of cognitive growth since the first 18 months of life. While social-emotional learning provides countless benefits to students as they grow into emotionally healthy young adults, it also helps prepare them for a future that is far different than the graduate-hire-retire framework their grandparents experienced decades ago. Tomorrow’s citizens will need to be flexible, creative, and able to work well with their peers — all skills we seek to foster at Presidio Knolls. PKS is committed to supporting our students' growth as global citizens by finding opportunities to apply classroom learning to real-world issues. For example, as part of our Kindergarten UoE on the Five Senses, students visit the library for the blind and deaf services and then apply their learnings to figuring out how to make our campus more accessible to differently abled people. Beyond what’s in the curriculum, many of our students choose to pursue service learning projects during the Wonderworks unit (a project based unit, whose topic and direction are fully student-driven). One third grader explored how people with disabilities were able to compete in competitive sports. She studied questions ranging from “How are people with disabilities being treated in the field of sports?” to “What do they need to help them compete with other athletes?”, culminating her study by developing an artificial leg. At Presidio Knolls, instead of assigning traditional letter grades our report cards reflect a balanced and formative approach to assessing our students. We use a variety of tools to understand student work and to give students and parents useful feedback that guides future learning. Our teachers get to know each child individually over the course of the school year, and provide parents with detailed written narrative progress reports three times a year. Formal parent-teacher conferences occur twice a year and as needed. All students are encouraged to reflect on their work and growth, and our older students eventually lead their parent-teacher conferences and present their self-reflections.